What you may not realize is that even if you don’t live close to an ocean, they still have a large impact on your life, and are more than just a recreational outlet. The reason we have air to breathe is because of the ocean. It provides more than half of the world’s oxygen and absorbs 50 times the carbon dioxide than our atmosphere. The ocean also regulates our climate and weather patterns by transporting heat from the equator to the poles so that we can have livable climates. It helps our economy too; with the majority of our nation’s trade relying on marine transportation to move the $282 billion in goods our country is able to produce due to the three million people employed by ocean-related industries. The ocean provides a lot of food such as fish and other ingredients used to make things like peanut butter and soymilk. The ocean also helps keep us healthy. A lot of medicinal ingredients are found in the ocean, supplying us with things that help fight cancer, arthritis, heart disease, and Alzheimer’s disease. 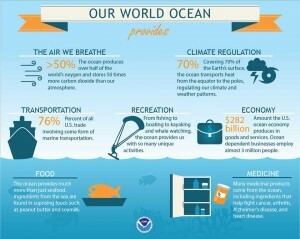 Who knew the ocean had such a big role? 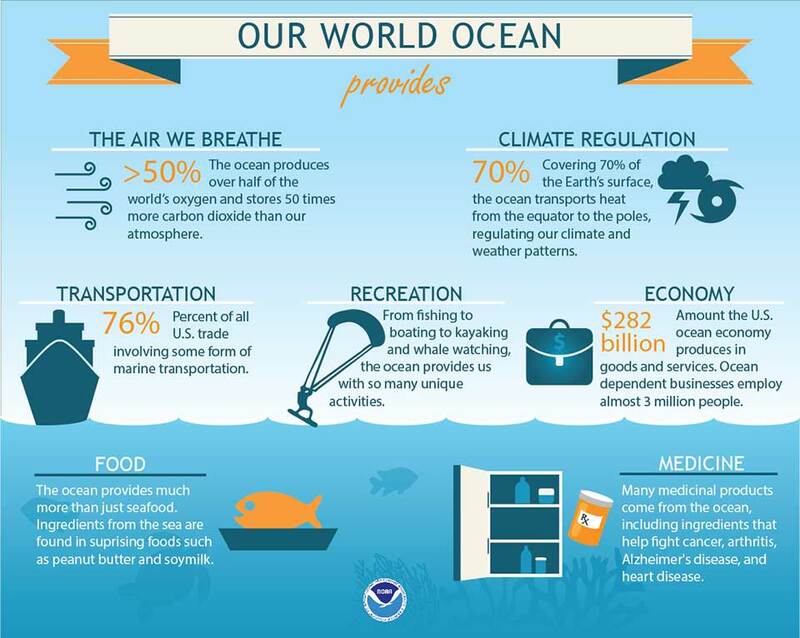 So how can you celebrate World Oceans Month? There are so many ways to show your appreciation. I want to point out that you do not have to live near the ocean to be involved. You can watch an ocean documentary with your family, make a donation to an oceanic foundation, or simply just spread the word about how important our oceans are. If you do live near an ocean, take a trip to the beach and pick up trash before having some fun playing in the water. It is important to remember that as individuals, our actions affect the planet. Oceans are a shared resource, so by keeping our nearby oceans clean, we are keeping the world’s oceans clean. If oceans are healthy, the planet is healthy.